Ships from and sold by JMAC Supply. 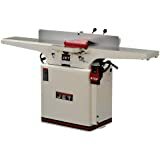 1791317K Features: -6'' jointer with helical cutterhead.-54HH. Assembly Instructions: -Assembly required. Dimensions: -Dimensions: 37.5'' H x 24'' W x 66'' D.
The Powermatic 54HH Six-Inch Jointer with Helical Cutterhead features a superior finish and quieter operation compared to conventional cutterheads with its helical cutterhead with 40 four-sided, indexable carbide knife inserts. 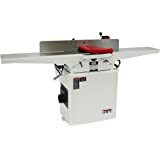 Designed and built to make your wood-straightening tasks easy and accurate, this heavy-duty jointer will remain a vital part of your woodworking shop for years to come. 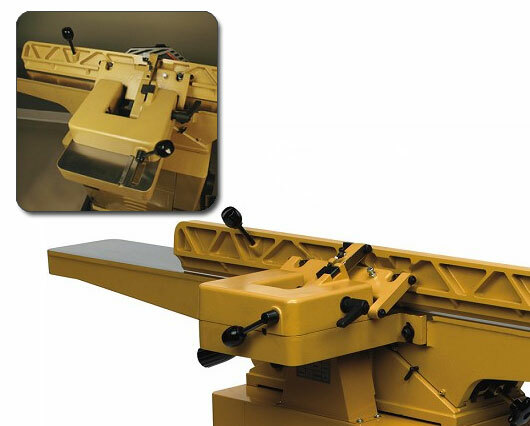 The helical cutterhead with four-sided knife inserts provides smoother, quieter cutting and finer finishes. View larger. The 54HH's fence is 38 inches in length with positive stops at 90° and 45° to the right and left. View larger. 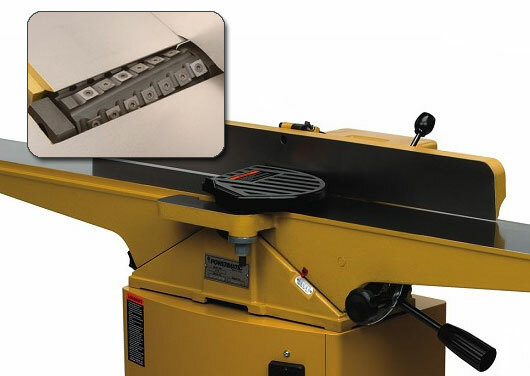 To provide stable footing--the key to optimum accuracy--the 54HH has a 21- x 13-inch (W x D), all-steel base cabinet that puts the table surface at a comfortable 32 inches above the floor. The one-horsepower, one-phase, 115-/230-volt motor (pre-wired for 115 volts) is factory-mounted within the base cabinet and can be converted to use 230-volt power. 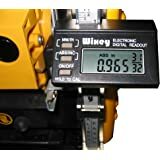 The motor is on a special mount for easy belt-tension adjustments, and the fine/quick adjustment lever on the infeed table ensures precision cuts. 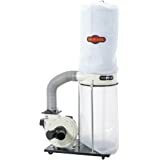 The base also contains the dust collection chute that evacuates debris from below the cutterhead via the exterior four-inch-diameter port near the floor--a design that keeps the hose out of the way to prevent tripping accidents. There are many cutterhead designs that carry the helical moniker, including simple straight blades broken into segments and dispersed around the cutterhead cylinder. 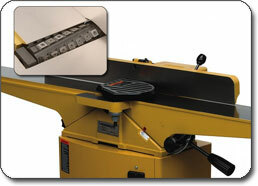 Despite the helical label, they retain many of the liabilities of the long-blade designs. 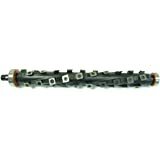 However, the 54HH features a true helical cutterhead with specially machined carbide inserts arranged in spiral-shaped rows for effective--and incredibly quiet--performance. 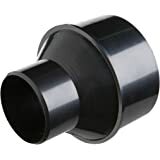 The inserts also have a four-inch radius ground into them and are mounted so they approach the wood at a 14-degree angle. This creates a true shear cut that eliminates much of the impact and the resulting fiber disturbance other cutterhead designs deliver. Also, the durability of the carbide combined with the low-impact, shear cutting action mean the inserts have an extended life. 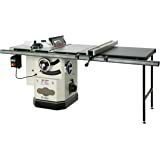 With a length of 66 inches and a width of 7-1/2 inches, the main precision-ground cast-iron table is one of the longest available in this class, providing plenty of support for large workpieces. It's conveniently mounted on dovetailed ways that keep it perfectly aligned through height changes. 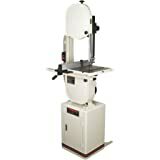 Adjustments are easy: the outfeed table height is adjusted with a handwheel mounted below the table; to adjust the infeed table, the handle can be moved up and down for coarse height changes or, the long handle can be rotated to make fine, precise height adjustments. The all-cast-iron fence system has a length of 38 inches, height of four inches--and like the tables--is precisely ground to ensure straightness. The supporting and tilt mechanism, made up of large cast-iron pieces, make this system as accurate and repeatable as it is durable. For versatility, the fence tilts up to 45-degrees towards and away from the tables. Also, fully adjustable stops at 90 degrees (vertical) and each 45-degree position make set-up fast and help keep the 54HH accurate with minimal maintenance, while center-mounted controls make for easy operation. The 54HH is backed by a five-year warranty. 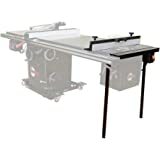 54HH Jointer assembly; one stand; one door with mounting hardware; one dust chute with mounting hardware; one fence assembly; one pulley cover; one belt; one cutterhead guard; two push blocks; one fence handle; one manual; one warranty card; and one hardware bag. 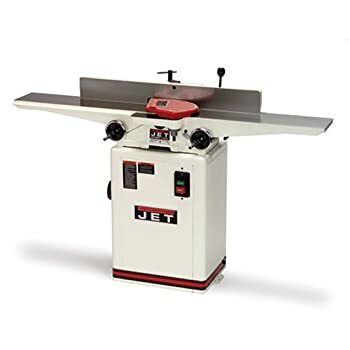 I've had this jointer for about a year, though I have not used it a lot. I'm an occasional woodworker, and this replaced a Grizzly 6" jointer. 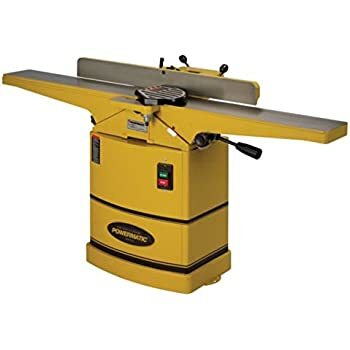 I like this jointer a lot. The table is very long, the base is stable, and there's enough weight to keep it solidly on the floor when I'm running a piece through it. It does a fantastic job of smoothing an edge. 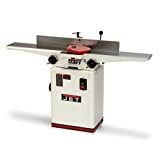 The old jointer was a "normal" cutter head, and it would tend to chip the wood when I was running through a piece with a wavy grain (typically cherry). With this jointer I've had no chipping at all (I assume due to the helicical cutter head). I had boards around with the chipping from the old jointer, and when I ran them through this one, all those chips disappeared. I like more figured wood, so I tend to have pieces where the grain goes one way for part of the board, and then the other way (or has a knot near the edge), and this cutter head did a great job making a smooth cut. Set up was not that hard. I did need my son to help me get the bed on top of the stand. That part is not a one-person job, so you'll need help for at least that step. (I did the Grizzly on my own, but this bed is much much heavier and bigger). I was able to get everything square and plumb without too much trouble (thanks to an Incra 5" square). And I love that I don't need to fiddle with the knives at all. 5.0 out of 5 starsExcellent Machine!! 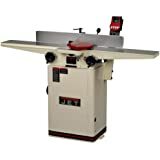 This is the first real jointer that I have had and I did a lot of research before deciding on the powermatic. 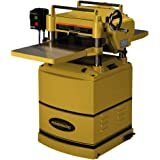 there are several brands out there and they are all very comparable but the two things I liked about the powermatic were the combination of the long bed and the helical cutter head. I came packaged well and the assembly was easy. it was only .002" out of level right out of the box. I have been using is for a few months now and am very satisfied with the overall operation. 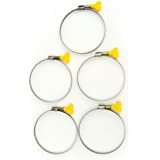 It is very quiet, and the adjustments are very easy to make. the only negative thing I have found and it is very minor. the heilcal cutter does leave very small scallop marks on the edge. Straight blade jointers do not leave these marks. I do a lot of edge glueing and this is not an issue at all, but if your needing a very smooth edge to finish you will have to do a little edge sanding. Usually one or two passes with 120 will remove any marks. overall this is a gread machine and i would purchase another one if needed. I've had this machine for about 2 weeks now and have run 30 3"x3" reclaimed oak beams through it. Each is between 6 and 8 feet in length and other than a few that were completely bent and twisted this machine has had zero problems. 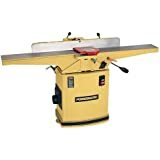 I'm not a professional woodworker and other than the small bench top jointer I tried prior to this one, have zero experience using a jointer. I was very impressed with how easy it was to put together (only needed a second person to lift the table on) and the fence and cutter we already aligned. It took me just over an hour from unpacking to turning it on for the first time. It cuts very easily and I've been able to get a square corner every time. This machine has a large dust port and it does throw out a lot of chips. I tried it without a dust collection system (I don't have one) and without a shopvac at first but it did seem to clog up. It's not ideal but I simply stuck the small shopvac hose up the dust port and the shop vac handles it ok. It does fill up fast so needs to be dumped often. I'd highly recommend this machine. This is the most incredible piece of equipment I own. It was very accurate right out of the box no adjustment necessary. I was using a Jet model and this is Light Years better than the Jet. It is a very heavy piece of equipment so you will need help assembling it once it arrives. The helical blades make this unit extremely quiet. I would recommend this to anyone who is looking for a high quality jointer. I am an amateur woodworker. However, I decided awhile ago that I would rather do woodworking than fiddle with cheap equipment. 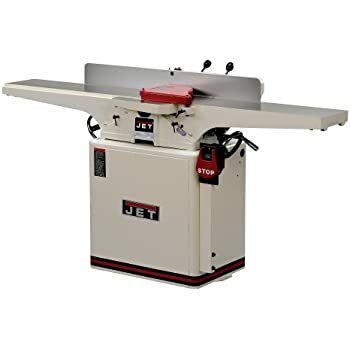 I had a Jet bench top combined jointer/planer. Unfortunately, I spent more time trying to get the jointer to joint properly than I spent making things. I did make lots of sawdust. But all for the wrong reason. 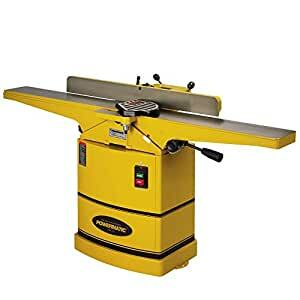 So I ordered this jointer and could not be happier. It went together easily, adjusted quickly and joints great. The helical knives are a terrific upgrade and do a magnificent job regardless of grain direction (at least to my untrained eyes). 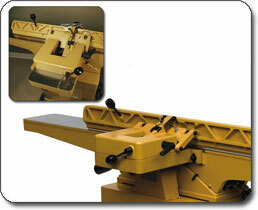 I called Powermatic with a couple of technical questions and they were very understanding, tolerant and helpful. 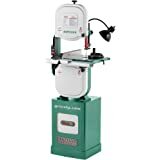 Since, I have also purchased the Powermatic mortiser, band saw and drill press. I know there are more expensive machines out there but for my usage I think these products are more than appropriate. 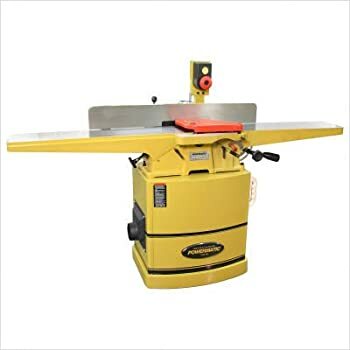 I love this jointer. I am very happy that I went with the helical head. Setup was very easy, and the quality of my work has gone up since getting this machine. I tried using my 2" dust lines with a reducing fitting but discharge area quickly clogged with shavings. I am currently allowing the waste to fall on the floor and have to sweep up the pile. Even without the dust collector connected there was little air pollution as most of the pieces were heavy and just fell into the pile. This was my first Powermatic tool, and I will be muting more after this great experience. 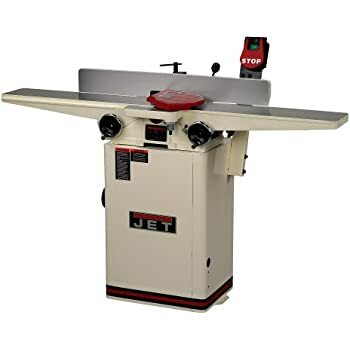 Had a Jet planer that I used for years, built a wheeled platform so I could move it around my garage, and then it tipped over and offset the tables to a point I could not fix them. Looked for a replacement and found the Powermatic. What a difference. Weighs a ton, but also bought the wheelbase and so solid and easy to move. the Helical cutterhead is so much better then the 3 knives I had in the Jet, easier to replace, smoother cuts, and no tear out at the end. Pricey but worth the investment.